Proudly serving Texas since 2002! Read Mr. Clint's Bayouography in Houstonia magazine ! Texas Snakes & More snake and reptile shows educate and entertain people of all ages - dispel myths and misconceptions, and bring about a greater appreciation and respect for these fascinating animals. Texas Snakes is based in Houston Texas, but travels anywhere in Texas. Our company has been featured on TV around the state, and on festival stages with a hundred to 3500 in attendance since 2002. Texas snakes are plentiful, beautiful and exciting to watch, capture and handle, if you love snakes the way we do. If you don't, there's still plenty to learn and respect. The venomous snakes found in the US are the rattlesnake, cottonmouth, copperhead and coral snake, and they all live in Texas, along with over 100 species and subspecies of non-venomous snakes. Identifying the difference between venomous and non-venomous snakes on sight is essential to safety, peace of mind and field collecting. If you know how to identify the four venomous snakes, you can know which snake is venomous or non-venomous, thereby enabling yourself to have an immediate plan of action. For the field collector, properly containing and handling a snake, without injury to the snake or collector, is determined by the species of snake, location and equipment. For the novice or photographer, knowing the difference between a venomous and non-venomous snake determines approach, distance (a zoom comes in real handy with a 5' Western Diamondback Rattlesnake) if a second person is needed, etc. Overcoming phobias is not easy when someone is raised to fear and hate snakes, but with a little knowledge and some verifiable facts, people can learn to give snakes the respect that they deserve. 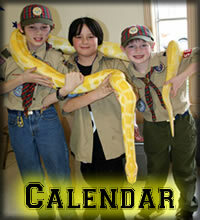 Texas Snakes & More is about education, field exploration, rescue (the home owner and the snake), and having fun. Keep coming back and learn more as our website grows. Is the Only Good Snake a Dead Snake? 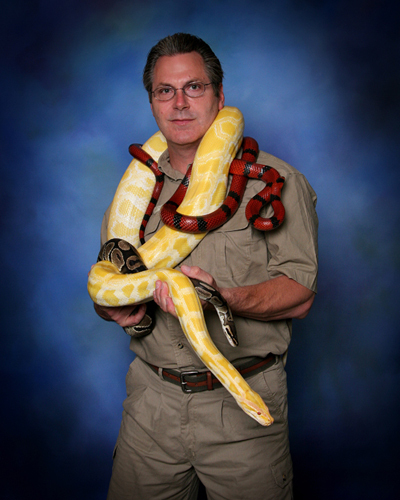 Mr. Clint and/or his snakes are also available for TV commercials, photo shoots for magazines/books, and films. Contact us for more info!